Over/Under: Over 194.5 at 1.90 Bet Now! The Golden State Warriors know that just one win will clinch their first world title in 40 years and Cleveland is the place to look to claim the title. The Warriors have triumphed in their last two games, but it hasn’t always been easy and they come up against LeBron James, a man who has grabbed two triple-doubles so far in this series. The Golden State Warriors look to secure their first world title in 40 years when they visit the Cleveland Cavaliers in Tuesday’s Game 6 of the NBA Finals. Golden State has won the past two games, including Sunday’s 104-91 victory, but Cleveland’s LeBron James will be aiming for another stellar effort to force a Game 7 on Friday. His 40 points, 14 rebounds and 11 assists in Game 5 was a fantastic achievement but you know that LeBron would rather be in the position of Stephen Curry. The NBA MVP for the season grabbed 37 points in Game 5, but he also stands on the brink of team glory, which is always the most important thing to aim for in basketball. With an 82-20 record and a 34-16 record on the road, the Warriors have been formidable this season and if they move on to 83 wins for the season, they will be champions. The Cavaliers have had a patchy season, as their 67-34 record for the campaign and their 38-12 record at home indicates, but it has also been a fantastic season for the Cavaliers. Both teams have a 7-3 record in their 10 most reason games. The Warriors have the stronger offence with average points of 108.6 compared to the average points of 102.4 for the Cavaliers. With respect to defence, the Cavs have averaged 97.9 points against them while the Warriors stand at 99.0. The bookmakers believe that the Golden State Warriors will pick up the title in this game, but they also think it will be a tough challenge for them. 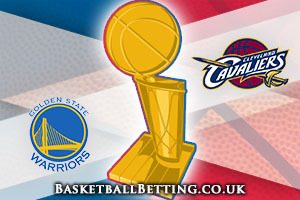 The Money Line for this game sees the Golden State Warriors being placed at 1.53 while you can find the Cleveland Cavaliers available at odds of 2.55. With respect to handicap betting, taking the Cleveland Cavaliers with +3.5 would normally never be a bad thing and it may be that the fire in LeBron James will be enough to carry them over the line one more time in this series. It is a hugely difficult game to call because there is no way that the Cavaliers will want to lose at home again and have their fans having to witness the Warriors party. This means that there will be a high level of motivation for the team from Cleveland to be at their bets but when you talk about motivation, you can’t find a higher level of motivation than the motivation that is available for the Golden State side. If they win this game, they win the NBA Finals and take the title for the season. Yes, in the back of their mind they know that if they don’t win they’ll have another chance to clinch the title, and at home, but when you have waited so long to be a Champion, you don’t really want to wait a minute longer. There should be a high level of passion and desire from both sides, but knowing that they can complete their dream season should be enough to provide the Warriors with enough to finish strongly. When you add in the fact that the Cavaliers have been looking tired late on in games, there is enough to suggest that Golden State can complete the job in Cleveland. If you are more focused on the Money Line aspect of the game, look to go OVER 194.5 and you will find this available at odds of 1.90. With so much on the line, mistakes will be made and you can expect to see both teams being nervous but also fired up. This could lead to a lot of points being scored, which will hopefully make for an exciting game of basketball for the millions of fans all over the world. Bet Now! This game could be the final game of the NBA season and if the Warriors win, it will be a fitting climax to a great campaign. However, if the Cavaliers can pull one out of the bag, there will be one more game to go, and the NBA Finals, and the entire season, will be de decided with just one game. No matter what happens tonight, it is likely going to give us a tremendous end to a great campaign of basketball.